This lovely bungalow has been recently re-decorated incorporating wooden floors throughout, paved patio area for outside dining overlooks the beach. All 4 bedrooms include built in wardrobes and vanity units with en-suite in 2 bedrooms. Oil heating throughout. Living room has large bay window with panoramic views of the Atlantic Ocean. Sky TV , Wifi, Dvd. The main bathroom is fully tiled incorporating electric power shower etc. The en-suites fully tiled features electric power showers etc. Oil fired thermostatically controlled central heating. Sky TV / DVD player / DVDs / Books/ Magazines etc. Fan assisted electric Oven/ Grill. Selection of novels & magazines. Private enclosed grass lawn at rear with beautiful panoramic views of Clonakilty bay. Patio at front overlooking Inchydoney Blue Flag Beaches . Panoramic Atlantic views. Outdoor table & seating with panoramic unspoilt views of Inchydoney Beaches & Atlantic Ocean . A 5 min. drive to the award winning Dunmore Golf course overlooking the Atlantic . Old head of Kinsale International Golf course 25 mls. A range of water sports surfing etc. available at the beach. Historic Clonakilty & West Cork's Wild Atlantic Way waiting to be explored. 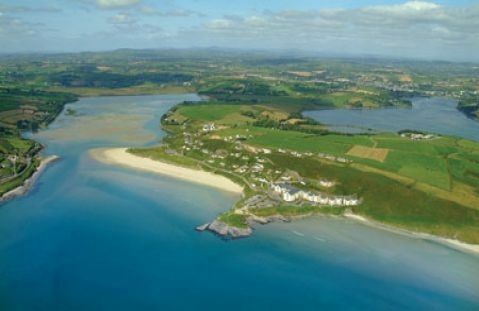 Internationally renowned Inchydoney Lodge & Spa Hotel located just minutes away. Lovely home away from home, great facilities. Very relaxing, amazing views and easy to walk to and from the beach. Delighted you all enjoyed your stay at "Sunville" Inchydoney and looking forward to welcoming you back in the near future. Wonderful, tranquil place in a beautiful position! The bungalow was lovely. It is in an amazing position with beautiful unspoilt views over Inchydoney Beach and the bay behind. Perfect place for a peaceful holiday. Clonakilty close by with all that you need and lots of great traditional music! Tony very welcoming and extremely helpful. Hoping to come back! Thank you so much for your kind review and delighted you all enjoyed your stay . Looking forward to welcoming you back again next year . The location is great; panoramic views of the sea and bay. The house is spacious and well equipped with everything you could need. Thank you so much for your kind review and delighted you all enjoyed your holiday. Looking forward to welcoming you back in the future . Fantastic location and awesome views! Tony provided the best house with amazing views at the front and back of Incheydonay beach and Clonakilty. The house was lovely and warm and literally had everything you need. A real home from home. We’ll definitely be booking again for next year! The WiFi works perfect as well! Thank you Dave for your kind review and glad you enjoyed your stay in Inchydoney , looking forward to welcoming you and family back next year . Appreciate your kind remarks and delighted you enjoyed your stay in Inchydoney , looking forward to seeing you again. Thank you so much for your kind review and delighted you all enjoyed your holiday in "Sunville" Inchydoney .Looking forward to welcoming you back in the near future. Many local attractions in the area some of which include golfing, fishing, horse riding, surfing and walking in the nearby sand dunes.